Woodbury is a man-made product developed for use in the moisture zones of your house. It consists of a timber core, encased in a synthetic product called ABS (read more below). Because Woodbury shutters are made to be resistant to moisture damage, they’re ideal in kitchens, bathrooms and laundries. However, they are timber shutters in their core and are not 100% waterproof, so should not be used outdoors. Woodbury is available in six standard paint colours. But with its synthetic surface, it can’t be stained. 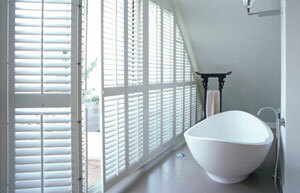 As Woodbury shutters are painted only and not stained, they are not susceptible to colour change. Woodbury is a very hard-wearing material, and is even more resistant to knocks and bumps than timber. Woodbury is very stable because of its plastic coating, and not susceptible to warping. In addition, the timber core is laminated, giving it greater strength and resistance to sagging. 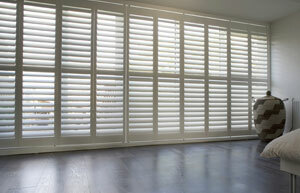 ABS, short for “acrylonitrile butadiene styrene”, is the synthetic material used to coat Woodbury shutters. It’s made by combining the ‘monomers’ acrylonitrile and styrene, and polybutadiene rubber. This results in a material with the strength and rigidity of plastic, and the toughness of a rubber. The cost of producing ABS is about twice the cost of producing polystyrene plastic, but the payoff is its superior hardness, gloss, and electrical insulation properties. 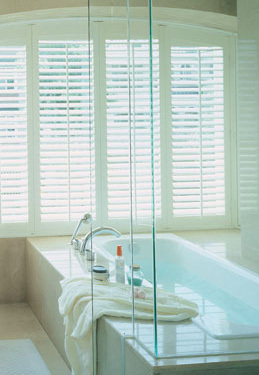 Add luxury and choose to have your Woodbury Shutters motorised.